Eau d’Italie is a luxurious fragrance collection inspired by the beauty and history of Italy’s Amalfi Coast. The brand has a lovely story. In Positano, an ancient village set on vertiginous cliffs, is the spectacular Le Sirenuse Hotel. This 18th century palazzo once served the Neapolian Sersale family as their summer home, and they converted it into a luxurious boutique hotel in the mid-20th century. Serving nobility, stars and tastemakers, La Sirenuse has long been a hub for those wanting to sample the best of Positano. The prodigious Eau d’Italie signature fragrance was created by husband and wife duo Marina Sersale and Sebastian Albarez Murena to mark the hotel’s 50th anniversary. Its popularity spawned more fragrances and the rest, as they say, is history! The first fragrance in the Eau d’Italie anthology is the Eau d’Italie Eau de Toilette. Created for the 50th anniversary of La Sirenuse Hotel, it recalls the romance of the Med and the intrigue of the ancient village in which the hotel stands. Before reading about this fragrance, I imagined Eau d’Italie to be a cologne-style fragrance in the same vein as Acqua di Parma’s Colonia or Roger & Gallet’s Jean Marie Farina. I couldn’t have been more wrong – in this signature scent there’s barely a citrus note in sight! Instead Eau d’Italie is all about a balmy, mineral aura, finely composed to replicate the feeling of throwing open the windows at the hotel and being greeted by the scent of the sea, the scrub, and the lingering incense from the nearby church. The result is a fragrance that manages to be both airy and imposing. Its accords are buoyant with the vitality of fruits, verdant greenery and flora including magnolia and tuberose, while antique echoes of liturgical incense resonate right through to the sun-dappled amber, lichen and honey dry down. Un Bateau pour Capri Eau de Parfum is one of the few specifically female fragrances in Eau d’Italie’s predominantly unisex line-up, along with Au Lac. Inspired by the picture postcard idylle of la dolca vita, that glamorous time in the 1950s when stars in head scarves and large sunglasses would stay at the Hotel La Sirenuse, Un Bateau pour Capri is endlessly chic. The luxurious fruity floral takes cues from the powdery cosmetics of those sirens of the silver screen, and the plush Mediterranean flowers that grow in abundance around the hotel. Ripe, juicy peach lifts this most floral of compositions and laces it with an endearing sweetness. A dry down of solar woods and musk recalls the scent of the sun-heated boat that speeds ‘la belle gente’, the beautiful people, over to crystalline waters over to Capri. This is my favourite of all four scents – it wears so beautifully on the skin. I find myself being a bit cautious of the instant charm of some fruity florals, which tend to wane after a short period of time. Un Bateau pour Capri bucks this trend, offering new and surprising waves of vintage flowers and powdery notes as it progresses before culminating in the most sultry, sunset-over-a-ripening-orchard way. It’s delicious! The second feminine offering is the Au Lac Eau de Toilette, a floral fragrance inspired by a doomed love affair between a princess and an artist. Do you love it already? Au Lac translates as By The Lake, specifically Lake Maggiore in Northern Italy in which the tiny island of Isolino sits. On this island there is a villa surrounded by extensive, romantic gardens that was the home of princess Vittoria Colonna, who fell in love with Umberto Boccioni, a painter at the forefront of the Futurism movement. Their short, passionate love affair took place in classical gardens at the start of the 20th century, and Au Lac sees perfumer Alberto Morillas retelling their story in waves of feminine florals and crystalline aquatic notes, set against the vibrant inspiration of a Futurist painting. The scent blends distinctive verdant notes including bitter orange leaves, fig leaves and osmanthus to create a feeling of euphoria, while aquatic water lily and papyrus recall the freshness of the great lake. Everything about Au Lac is tinged with this same uplifting and hopeful character, even its mineral woods-and-amber dry down is soft and sweet. It’s a beautiful and evocative scent. Like all of the Eau d’Italie fragrances it has excellent source material and a suitably impressive back story. Inspired by the time when Sicily belonged to Greece, Syracuse was a fragrant court made up up orchards, and the nations were ruled by poets, this fragrance captures the passion and vibrancy of a bygone era. Light and shade notes keep the momentum of Jardin du Poet going: the bitterness of orange and grapefruit, the saltiness of basil, the heat of pink pepper, the intense greenery of vetiver. Together, they make for a decidedly naturalistic fragrance that is unique and wonderfully fresh. 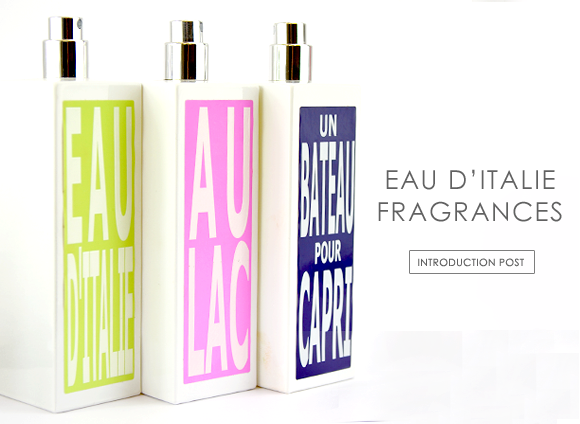 Have you tried any Eau d’Italie fragrances? This entry was posted on Wednesday, May 29th, 2013 at 9:29 am and is filed under Fragrance, New products, Spotlight On. You can follow any responses to this entry through the RSS 2.0 feed. You can skip to the end and leave a response. Pinging is currently not allowed.